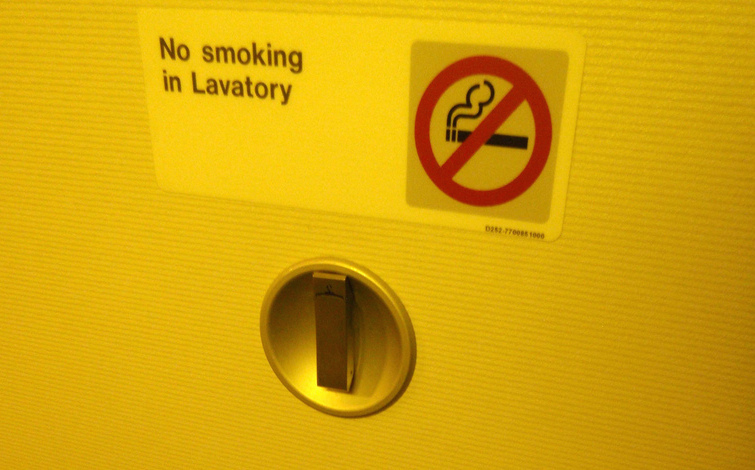 Though it might seem like “no smoking” signs on airplanes aren’t even needed anymore — who could possibly think lighting up a cigarette in an enclosed cabin filled with other people is okay? — there are apparently those out there who still need reminding that smoking isn’t allowed. To wit: a United Airlines flight headed to Boston from Denver was forced to turn around after a passenger reportedly lit up and refused to stop smoking. Officials said the flight returned to Denver International Airport around midnight on Friday due to a disturbance on board, an airport spokesperson told Channel 2 News in Colorado. A male passenger was smoking in the bathroom, a United representative said, which goes against federal regulations. After he refused to put out the cigarette, the pilot had no choice but to turn around after only 30 minutes into the flight. Denver police then met the plane, and the passenger was taken to a local hospital for detoxification. That might indicate he was drinking, but it’s unclear from the report. Because the crew had exceeded their legally allowed duty hours, the flight was canceled and the passengers were rebooked for a flight on Saturday.